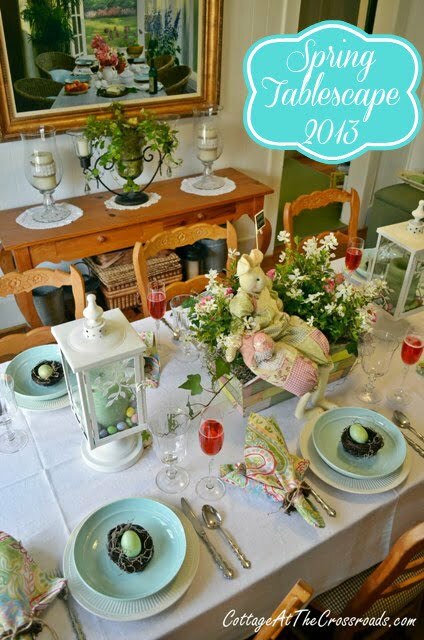 I thought I’d bring a little spring into your life by sharing our Easter tablescape with you today. It’s cold and rainy outside, but it’s definitely springtime inside the cottage! 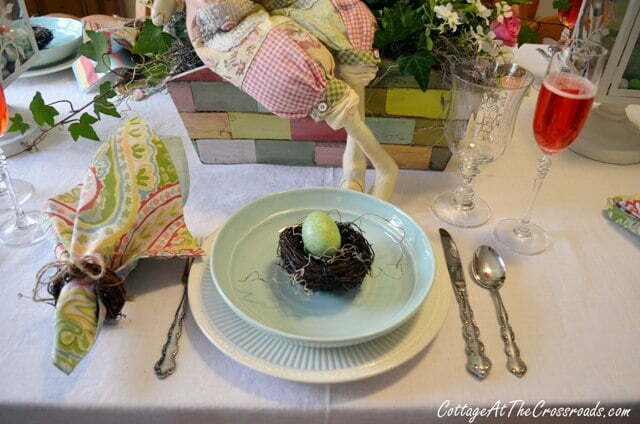 I have been slowing gathering some of the items I used in this spring tablescape over the past several months. It all started when I spotted these napkins in Belk’s. It was snowing that day, but the colors in these napkins shouted spring to me and they were on sale! I’ve used these miniature grapevines as napkin rings in previous tablesettings. This time I just tied a little twine bow on them. The napkins are reversible with a pretty stripe on the other side that you can see in this photo. About a month ago, I saw this wooden basket in Tuesday Morning, and I knew it had all the same spring colors in the napkins. I couldn’t get to the register fast enough! It looks like the rectangles are just painted on, but they aren’t. 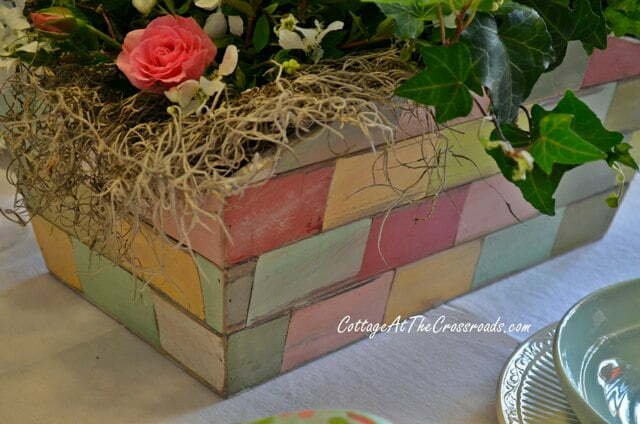 Each rectangle is an individual painted piece of wood. I think it’s made from shims because just recently, I’ve seen some other things online made from them. This white linen tablecloth was a thrifty score last fall, and you can read more about it in my post Cotton on our Thanksgiving Table. The white dishes are Italian Countryside by Mikasa, and we use them everyday. The goblets and champagne glasses are by Mikasa, too. I bought them years ago at the Mikasa outlet near Charleston, SC. The flatware is by Oneida but I do not know the pattern. The aqua bowls are a recent purchase from HomeGoods. I had met some of my Bunko friends for lunch in Columbia, SC last week, and I promptly put them in my buggy. My sister-in-law gave me the nests in each bowl, and the faux eggs I’ve had for years. 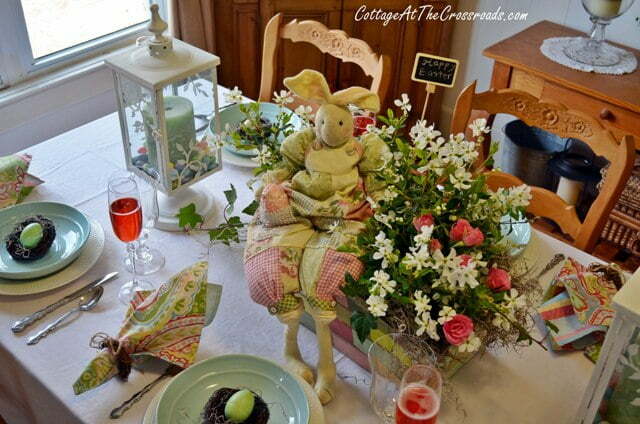 In creating the centerpiece, I decided that I would use this fabric bunny whose outfit is a perfect match to the napkins. This is the same bunny that one of my cats fell in love with last year. If you want to read about something strange, check out the post Bunny Love! This year my cat will have nothing to do with this bunny. I guess that was SO last year! I picked up these pretty pink roses to tuck into the centerpiece since I don’t have many blooming things in my garden yet. The roses are small, and there were several of them on 2 stems that I bought at Wal-Mart. I cut the white flowers from a shrub in our yard. I have no idea what it is, but the flowers have a wonderful fragrance. When we moved to the Crossroads, this bush was overgrown and straggly, and we nearly removed it. But pruning and fertilizer have worked wonders on it. Can anyone identify it? I wondered how long the white flowers would last, but they’ve been cut for 3 days now and they still look great! 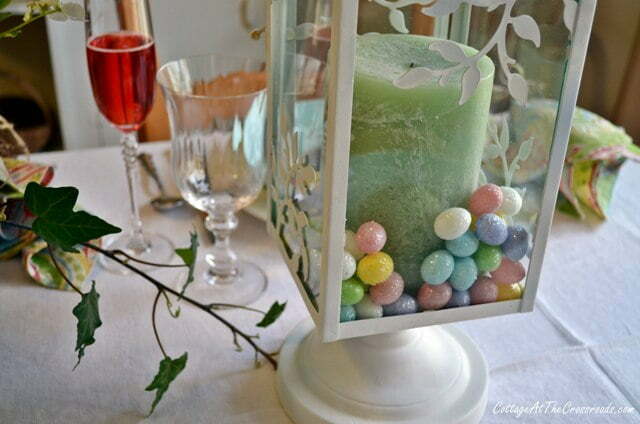 I used these white lanterns in our Valentine’s Day Mantel, but with a quick change of a candle and some glitter eggs, they transformed into Easter magic! You’re probably wondering what kind of bubbly drink I have on the table, aren’t you? It is simply sparkling apple cider tinted with red food coloring. It is a very refreshing non-alcoholic drink that you can use to make a toast to spring! 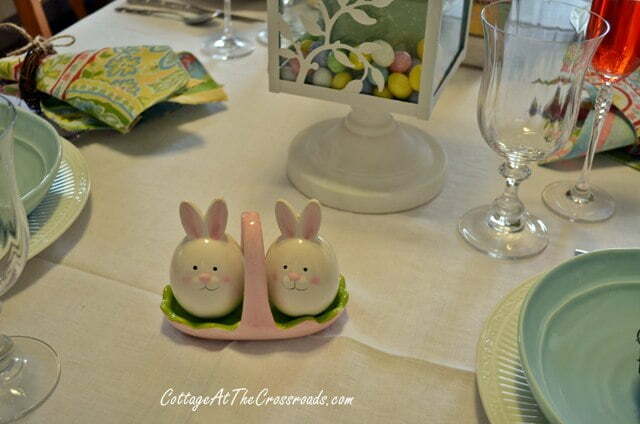 The bunny salt and pepper shakers complete my Easter tablescape, don’t you think? I found them on sale at Hamrick’s this week. ADORABLE! 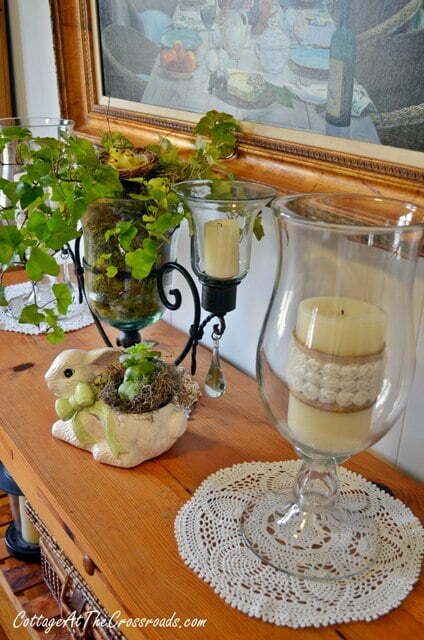 The sideboard got spring-i-fied with this little bunny planter. Can you see the little nest tucked into the ivy? Don’t those baby birds look real? I couldn’t resist them when I spotted them at World Market! 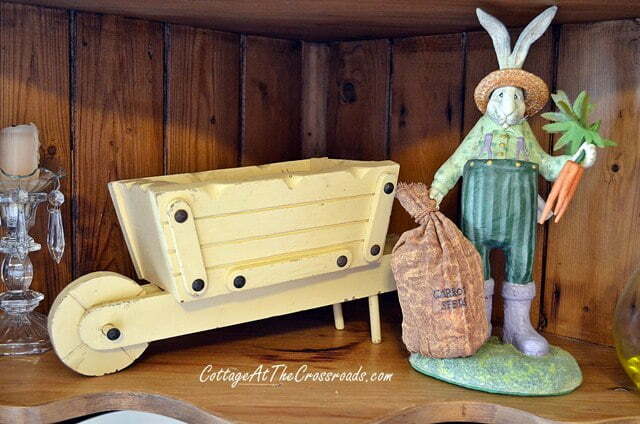 Farmer Bunny is hanging out in the corner cabinet along with a little wheelbarrow that I found at the auction. We sell some of those auction finds in The Shop at the Crossroads. 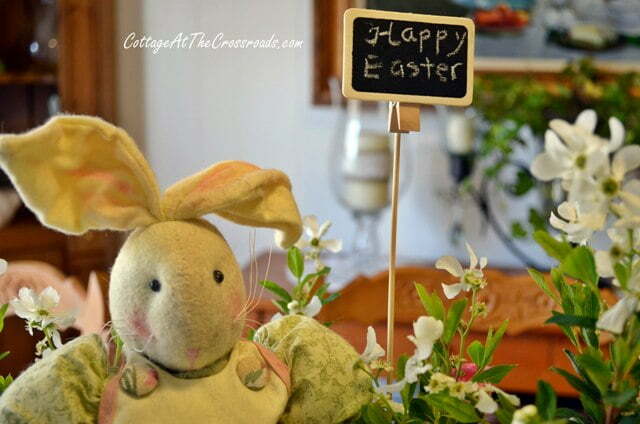 I hope you’ve enjoyed seeing our Easter tablescape. It should put a little spring in your step! The bunny says it all, don’t ya think? The flowers look like jasmine. Fragrant vine. I love the bunny in the basket. The basket is really cute with its multicolor finish. The pretty aqua blue plates are lovely. I saw your post on Hometalk. The white flower in your arrangement looks very familiar to me. We have a shrub in our yard that my Grandmother always referred to as a “Pearl Bush”. I love the white flowers in the springtime! Your arrangement and other decorations are beautiful and add just the right touch to your home. Thanks for sharing! 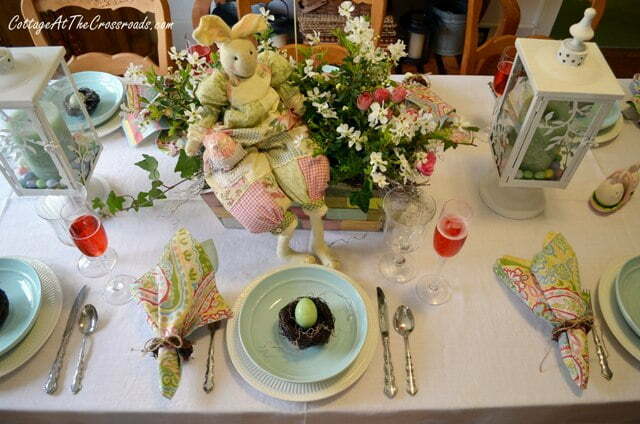 Love your Easter table and all of it’s little touches. The napkins are beautiful. Jane, the napkins are beautiful. They make a beautiful statement and definitely set the stage for your other spring details. The wooden basket is very unusual and so pretty. Thanks for sharing this spring table. Happy Easter! I am really, really hooked on this centerpiece. Yes, it does appear that each individual slat is perhaps from a shim. This is super cool! I wouldn’t have the patience (OR the skill, I’m sure!) to make it myself, but this is really slick! I’m sure you were hustling to that checkout stand to make this your own! You’ll be able to use it in so many different scenarios with all these wonderful colors! 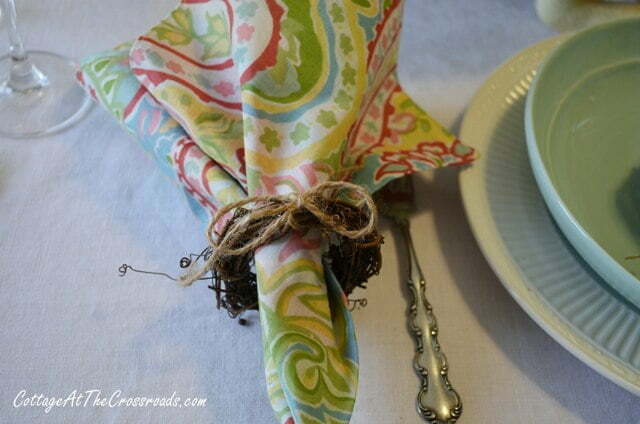 It’s perfect for the table you’ve created here…like it was made to go with those napkins!!! I LOVE the color of those bowls! They really have that “Easter egg color” going on! Oh, I do love those baby birds in the nest!! Also, your table looks wonderful – the centerpiece is fabulous and the napkins were a genius starting point. I do not think that the Easter Bunny will miss your house. He will feel right at home! I love your tablescape. The colorful basket is great and I really like how you filled the lanterns to make them for spring. Very pretty. Love your table! That Easter basket is awesome! Your did a beautiful job on decorating it and I love the bunny sitting there! The lanterns are adorable and so are the bunny salt and pepper shakers! I wanted to use some blue plates in the color range too but my table dictated otherwise. Lovely table. I love your centerpiece and the aqua bowls. All the touches are so pretty. The baby birds are adorbs! Thanks for sharing. Beautiful tablescape , so much wonderful eye candy! Happy Easter! 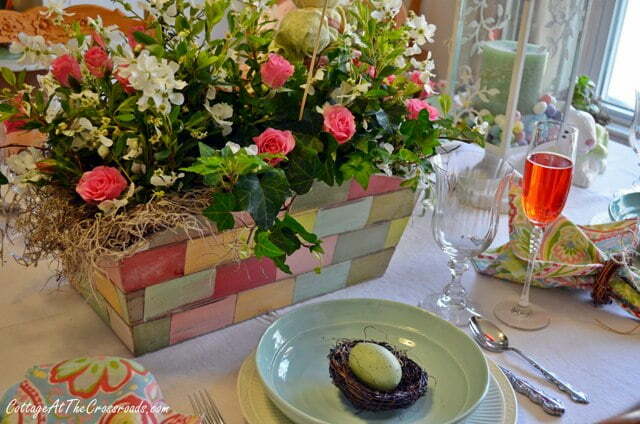 What an adorable table, Jane…love the centerpiece basket, so spring-y. The nest with the baby birds is so darned cute! Loved seeing your beautiful Easter t’scape! So many pretty details! 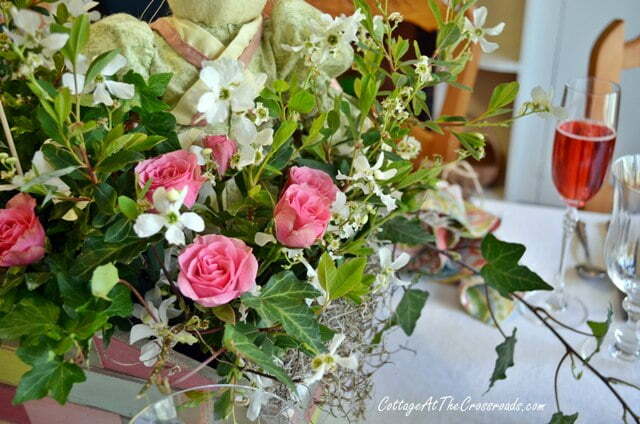 The centerpiece is magnificient in the colourful box and the florals and the bunny on the side. The lanterns with eggs inside is a great idea. 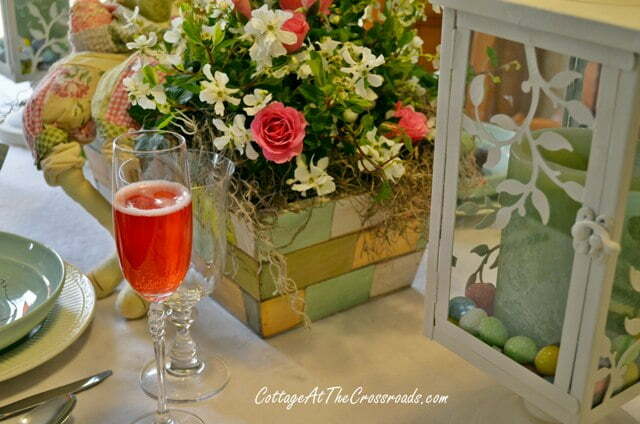 Wish I could stop by to share in that “bubbly” drink and have a toast to the spring-feeling of your table! Happy Easter! Hi Jane, I had to go through your post twice as I loved it sooo much! The shade of blue of the bowls is just so soft and pretty. The centerpiece box would’ve hopped into my cart, too. Isn’t it perfect with all your colors from the inspirational napkins? Your darling bunny with his chalkboard is adorable and those s & p shakers are, too. I love the pretty filled lanterns. It all says “Spring”! Happy Easter blessings. Your Tablescape is Gorgeous with your lovely centerpiece and adding the lovely lanterns with eggs and the nests on the plates just make the table pop. I hope you and your family have a wonderful Easter. Beautiful tablescape, Jane. The colors are wonderful. I love the centerpiece and lanterns. Your table is beautiful. I love the rabbit. Looks like you are all ready for Easter. Have a Happy weekend. A breath of Springtime to the winter worn blogger. I hope Spring arrives soon! Love the lantern and the bunny s and p add the perfect touch. Hop over tonight at 7 and link up to Let’s Dish and share this! I love everything about this! The little nesta on the plates are the crowning touch. Just so sweet! Oh, my! Your table is just darling! Love your centerpiece and the lanterns. Your dishes! Oh my gosh I don’t know where to start! 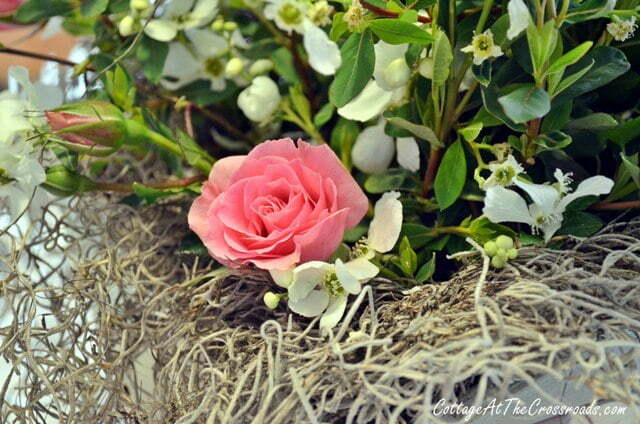 I love the egg nests…the pink roses…the napkins. Oh and the lanterns too. So pretty and festive! What a great table! The colors are all working together without looking at all contrived — just the way I like it! Now that is a Spring table! Oh I adore those napkins and that is the cutest bunny ever. It’s definitely put a spring in my step – and I need it on this snowy day! Great find on that wood shim box – it’s fabulous! As usual – another beautiful table. Enjoy your Easter! Gorgeous! The eggs in the nests are my favorite thing. Thanks for linking this up to Monday Funday! Oh your table setting is just gorgeous!! Kove all of the beautiful Spring colors. That’s the sweetest table setting! You had at me at the first shot with the open French doors reflected in the mirror, but then hung on with those fabulous napkins and box. What perfect colors. I have the hardest time finding patterns I like and those napkins are amazing! The little birds are pretty darn cute as well. What a wonderful setting for an Easter gathering! this is such a beautiful setting. I love it all. Hugs! Your spring table looks wonderful, Jane. Don’t you love when you find things in different places and the colors work so well together? It happens so rarely for me, that I get really excited when it actually works out that way. 🙂 I have no idea what those white flowers are, but would love to know! Gorgeous centerpiece. Love the lantern with eggs and the nests on the plates too. LOVE your Spring table Jane! 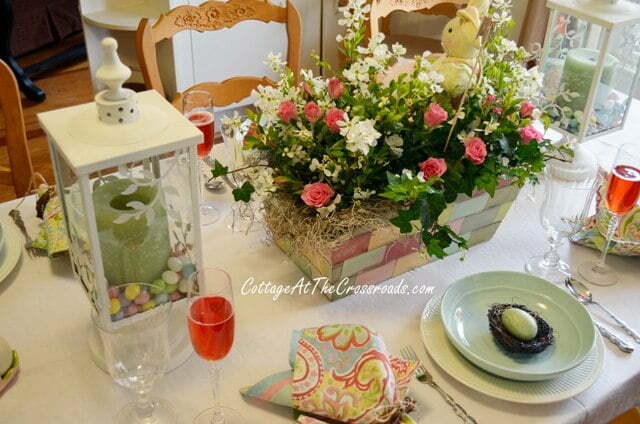 Your new pastel from Tuesday Morning makes a wonderful centerpiece for your table and I love your lanterns transformed for Easter with your glittery eggs! I totally missed those adorable baby birds at World Market, they do look real 🙂 Hope your weather is better than ours today which is cold & rainy! So pleasant to view. Fun to see new and your ‘every day’ put together to make a gorgeous setting. I really liked the candle wrapped with burlap and (?) little white deals for a new look. Happy Palm Sunday! Hosanna! I love it all. Funny about your cat’s lack of interest in the bunny this year! Jane, you have a real talent with decorating! This tablescape is gorgeous! Your table look so nice Jane! 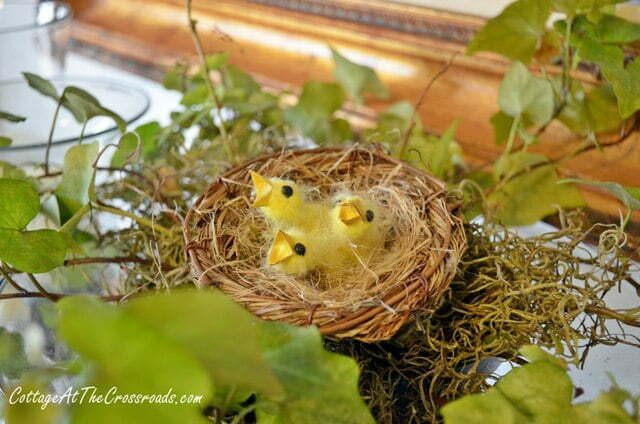 I love the bowls, the nests, the centerpiece, the napkins…. Ok, all of it! The little nest with the baby birds is so cute too! 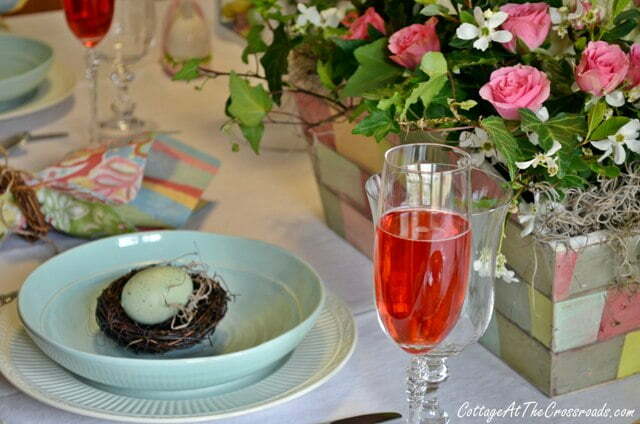 Such a pretty Easter tablescape. Love how you used so many things that you already had on hand (like the lantern). Those little nests inside the bowls add the perfect touch. That’s the perfect size arrangement for your nice big table. Bunnies and chicks are so sweet for Spring! I love the World Market birdies! Happy Spring! You have a wonderful way of making a dreary day much brighter. Love your table and your talent. Thanks for sharing and Happy Easter! Jane everything about this is so pretty, the colors, the textures, the flowers, bunnies…love it! Your table is wonderful. Cute napkins and I love the birds nests.